*Tom Hanks’ biracial granddaughter has been seen out in public for the first time. The baby (name unknown) was spotted out with her mom Tiffany Miles, who allegedly had a drunken one night stand with Hanks’ troubled 26-year-old son Chester Hanks (Chet). Chester — whose been in and out of drug rehab — is an aspiring gangster rapper and he uses the moniker Chet Haze. Chet was not with mom and daughter as they ran errands on December 13 close to Tiffany’s home in Indio, California. An onlooker who saw the baby and Tiffany said: “You can tell straight away that it’s Tom’s granddaughter. The similarities between her and Tom are incredible. They both have the same high forehead,” the source added. Tom and wife Rita Wilson welcomed their new granddaughter into this cruel world last April, according to a report by In Touch. Chet has since released a video saying his new daughter has inspired him to finally deal with his alcohol-and-drug issues and lead a sober life. 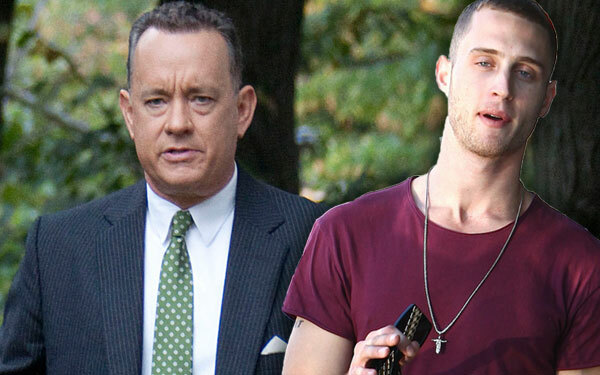 Watch the slideshow above of baby, mother and Tom Hanks. He looks like a bum. Really? What’s up with yall black women choosing bums to have kids with just because they or their family are famous? He looks like a straight up addict.